We have three different commission options to meet the needs of all of our owners, as the market and guest needs are ever changing. If you would like more information please click HERE to give us a little information about your property and we will promptly get back to you. What happens when owners want to use their cottage? We love when owners come to visit and can enjoy their second home! With changes in the industry in the past years studies have shown that there is a large percentage of travelers that book at the last minute. Our reservation management system is "Live" time and always up to date. Please ALWAYS look at your property listing calendar on our site or email us at [email protected] to be sure we haven't booked your home at the last minute. If you do decide to come up please let us know so that we don't rent it during your stay in case there is a last minute inquiry, this also insures it can be sure it is clean for the next tenant. Do you let us know each time the property is rented? We give each owner an owner portal. Within this portal you can view published statements, rental calendars and reserve your own dates. Rentals are changing on a daily basis so we do not contact owners each time there is a change. If you prefer to email us to check in we always welcome owners to do that. Who do I talk to when I call office? We are a small company and you can speak with anyone. We do each have specific roles but focus on communicating a lot with each other as well. If someone cannot answer your question we will make sure to get back to you with an answer quickly. What email should we use when contacting you? [email protected] - goes to the entire office, this is best used when asking about calendar dates, or an immediate response is needed, etc. If you have a specific question for Heather use [email protected] or Michaela use [email protected] . What happens after a rental? Someone from our staff checks the house for any damages. We also check to make sure safety measures remained intact, the lawn is mowed etc. We arrange for cleaning and check the house after the cleaning to make sure it is ready for your next guests. What sort of normal wear and tear can I expect on my property? Small appliances or kitchen utensils may wear out or break faster than normal. Walls may get marks, comforters, sheets and pillows wear etc. One of our commission tiers includes a professional linen service, this not only saves on the wear and tear of your sheets and towels but it cuts down on water and septic usage. Where our area has been in drought conditions for the past couple years any water conservation is huge! Why advertise on HomeAway/VRBO/Airbnb if I’m using a rental agent? These companies are only listing companies and don’t provide other services. However, they do spend a lot on advertising for their websites. We continue to do a thorough check on tenants that come through this avenue but believe the more places we advertise the better for the owner. What safety measures are required by your company? We do require each Your Island Connection owner to follow State regulations regarding smoke and carbon monoxide detectors. Within our company we strongly recommend you have a smoke detector in the kitchen area and outside each bedroom as well as a Carbon Monoxide detector on each level of the home. Each house must have GFI outlets in the kitchen and bathroom. A fire extinguisher is required in the kitchen. Yes, we require you to have a renters insurance rider or separate policy for your home. Different insurance companies have different requirements in terms of this. We are happy to provide you with a list of suggested companies. Should my rental be pet friendly? Yes, approximately 70% of traveler's nationwide prefer to travel with their pet. We take great measures to ensure the pet owner is responsible and the pet will be respectful an up to date on all vaccines and flea/tick treatment. Vacationers that decide to bring their pet sign a separate pet contract and we collect a refundable pet deposit should any repairs or extra cleaning be needed. We also can handle pets case by case. What is the benefit to allowing less than a week renters on the shoulder seasons? 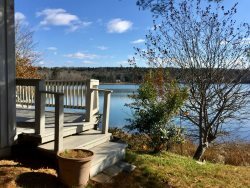 The rental season in Harpswell runs mainly from Memorial Day to Columbus Day, with peak season being the end of June until Labor Day. During this time frame we rent strictly by the week. We have Saturday to Saturday and Friday to Friday rentals. During the shoulder season we do find more people looking for less than a week. 72% percent of stays nationwide are less than a week. How am I paid for rentals? All money is collected from the guests prior to their arrival, so they are paid in full before getting to your home. We accept ALL major credit cards and personal checks. Starting in April of each year we provide owners with a monthly invoice and check and provide a 1099 at the end of each calendar year. As tenants pay we give owners 50% of the rental rate less the commission and the balance is sent after their departure.